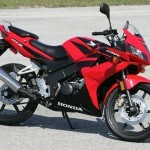 This Friday, November the 14th, I have taken and passed the motorcycle road test. Initially, I wanted to film the test on my helmet cam, but did not because my only curved mount is glued to my summer helmet, and it was too cold for the dirtbike-style helmet that day (I’ll probably keep it stored until April or May of the next year). Length: about 45 minutes, mine was from 2.20 pm to 2.55; including the test itself, the feedback from the instructor, and getting my picture taken for my new licence. Cost: $35 for the test, $75 for the license. The $75 is only due of you pass the test. Once issued, the license is good for 5 years. 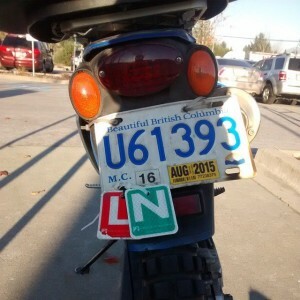 Location: my test was taken at Port Coquitlam ICBC at 1930 Oxford Connector. This was my second test at this location. Normally, you need to wait a few months before the test date, but I was able to book a test with a week’s notice. How to book a road exam: online at ICBC’s website or by phone. If you do not show up, or cancel your exam within 48 hours or less prior to exam date, you will still have to pay. If you are mobile, it is best to let the ICBC call center agents decide where to book you, as they will be able to book you the soonest possible date. My preffered locations were North Vancouver and Burnaby )for the proximity to my work and home), but I took my test in Port Coquitlam. This was my second attempt at this test – fist time I was failed for (get ready) being overly cautious, more specifically, going 30-40 in a 50 zone (80% of the time we were in the residential area, and I thought it is better to be safe and not too go too fast with kids around, but the results of the exam determined that was a false assumption). Before we left the ICBC parking lot, the examiner gave me a 2-way radio (similar to the ones that truck drivers use). She explained that I am to listen to the instructions (which were told twice), and to tap on the helmet if I did not hear clearly. During the test I was supposed to ride at a normal speed, pretending I am riding solo – this means no waiting or slowing down, unless specifically instructed to do so. examiner rode as a passenger in the car behind me. She checked the hand signals (left/right/stop), and the functionality of the safety equipment (signal lights, low/high beams, horn and kill switch) and off we went. I rode a few blocks on the main road (Lougheed Hwy), and then was routed towards residential block. Repeatedly going through the stop signs, in and out of the school zone; parking on a hill, starting on the hill; hazard perception (“tell me what hazards you see on this [empty] street”); merging in and out of traffic and reverse parking in the end. 1. Know all the road signs. Speeding in a school zone is considered a dangerous action, and you will automatically fail should this happen. 2. Check if the motorcycle functions correctly. If something isn’t woking right, you will not be allowed to take the test. 3. For insurance (and I hope for ethical reasons also) trick questions and requests are not allowed; e.g. they will not ask you to do a left turn on the intersection where left turns are prohibited. 4. Look out for signs and keep as close as you can to the speed limit, if conditions permit. I am not sure if they will let you travel at a slower speed if it is raining, etc. – it is best to ask your examiner. 5. Take your exam on a 200+ cc bike. If you take it on a smaller displacement bike, your license will have additional restrictions. P.S. : Went to see “Dumb and Dumber To” – it sucked.